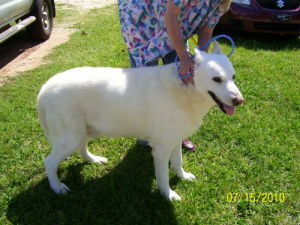 This is Toby from White Shepard Rescue in FL. He is currently in GA at his vet’s where he was dropped off to be euthanized. The vet persuaded the owner to surrender him and he has been at the vet’s office being cared for ever since. Thank goodness for the compassion of this Veterinarian. Read more about Toby tomorrow or visit his profile on Petfinder. I use petfinder.com to search shelters and rescues throughout the country for participants in Furry Friday. This is my go-to resource for finding animals available for adoption throughout the country. We used this tool in many of the rescues I worked with to find good candidates to come into rescue. I’ll do a post about Petfinder next week. If you are a shelter or rescue and would like to be featured, please contact me at: laurabellesboutique@hotmail.com Again, Furry Friday is in no way sponsored by petfinder or any shelter or rescue, it is simply my opinion and my way of showing support to all the thousands of pets awaiting their forever homes. Posted in lucky dogs (and cats) and tagged animals available for adoption, dogs and cats, Furry Friday, petfinder. Bookmark the permalink.